Collecting the right IRS W-8 form (W-8BEN, W-8BEN-E, W-8ECI, W-8EXP and W-8IMY) for foreign vendors is more complex than IRS Form W-9, and to add another layer of complexity – they can also expire. That means there must be a way to track the expiration dates of those forms. 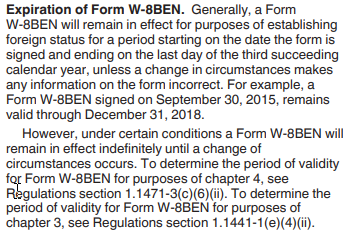 Based on the excerpts, if you collect either the W-8BEN or W-8BEN-E from Foreign vendors, you may need to track expiration of the forms by 12/31 of the calendar year. Why is it important to track? IRS W-8 forms apply at the time of payment. If you fail to track and your company makes a payment to a foreign vendor that does not have a valid W-8 on file, you have missed the requirement to backup withhold under IRS presumption rules at 30%. Your company may be on the hook for the 30% plus assessed interest and penalties. What if the form does not have an expiration date? If a W-8 form is otherwise valid, you can use the date you received the form. Tracking can be within your Accounting System or ERP, within your Vendor Self-Registration Portal, or lucky you, handled by an external team outside of Accounts Payable (my favorite). For those Accounts Payable teams that have the responsibility but none of the above methods to handle automated tracking – a manual process is required. Accounting System or ERP – Include your desktop procedures the fields that need to be populated to identify the foreign vendor to be tracked. Whether that means entering the date signed, entering the expiration date or checking a box. Have an Accounts Payable Team member pull reports or export data to track receipt of forms due. Have Robotics Process Automation (RPA) software? Automate pulling the report or exporting the data – or any other related task. Vendor Self-Registration Portal – The functions of vendor portals vary. Unless there is an automated email that generates to the vendor and tracks the receipt and entry of a valid interactive IRS W-8, full or partial manual tracking may still be required. Even with automation, have an Accounts Payable team member pull a report to identify the expiration date of eligible vendors and receipt of a valid W-8. External Team – Ensure that for forms for all new and updated foreign vendors are sent or routed to the external team. Consider having them approve the forms prior to vendor setup or payment. Assign a point of contact if that team has questions, needs vendor information or needs invoices pulled when preparing tax forms. All – Be prepared on Jan 1 to appropriately flag those vendors who do not have a valid W-8 form on file so you may backup withhold. Once the vendors see that they have taxes withheld that will be a great incentive to forward the applicable W-8 form. Once you receive a valid W-8 form, don’t refund any backup withholding payments to the vendor. They will need to include any withholding payments with their annual tax filing. No one wants the extra burden of backup withholding payments (many companies track those manually as well) so start early and collect those W-8 before they expire. As normal, review these recommendations with your leadership, auditing team, and/or tax professionals and adjust for business needs. Expanding on this topic on this weeks podcast - check it out Sunday! Want a handy Cheat Sheet that includes the links to vendor validation resources? Sign up for my mailing list below, download the Vendor Validation Reference List and share with your entire team! All Subscribers are entered into a monthly drawing to win a Putting the AP in hAPpy coffee mug.